Apex Town Hall is located at 73 Hunter Street, Apex, NC 27502; phone: 919-249-3400. Photo: Apex Union Depot, corner of North Salem and Center Streets, photographed by Seth Ilys, 2004; en.wikipedia.org, accessed February, 2011. The Union Depot was listed on the National Register of Historic Places in 1988. Located between the Neuse and Cape Fear Rivers, first settled about 1867, Apex was incorporated in 1873. 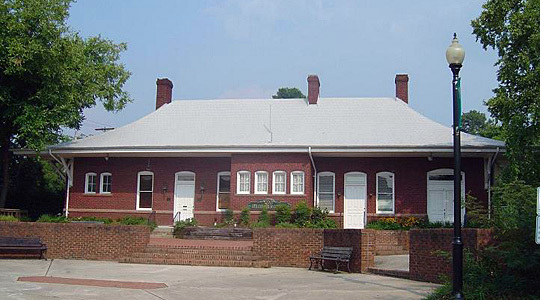 The name was chosen in recognition that the town site was located at the highest point of the Chatham Railroad which ran between Richmond, Virginia and Jacksonville, Florida.